Nearly all of Russia’s contemporary designers have been launched at Russian Fashion Week, this year renamed for its sponsor, Mercedes-Benz. Photos by Elena Pochetova. View the extended slideshow here. Mercedes-Benz Fashion Week Russia, which was known as Russian Fashion Week until 2011, has taken Moscow’s sophisticated audience on exciting voyages to the world of modern haute couture twice a year for the past decade. This year is no exception – the 24th season of Fashion Week was marked by shows from both fashion maestros – Slava Zaitsev celebrated his 50th anniversary in the fashion business during the festivities – and collections by young designers, such as Marusya Zaitseva, RUBAN, Yanina Vekhteva, Maria Golubeva, Dima Neu). “The original plan was to turn Fashion Week into a systemic event for the local fashion market,” said Alexander Shumsky, producer of Mercedes-Benz Fashion Week Russia. Although it would be premature to call the Russian market a full-scale fashion industry, according to Shumsky, since its inception, RFW has managed to improve the situation markedly. “Almost all the prominent names in Russian fashion were launched at Russian Fashion Week. The appearance of the event’s title partner – Mercedes-Benz – this year proves that you really have to reckon with Russian designers. They will have more opportunities now,” Shumsky said. Fashion Week is a chance for designers to show that their creations are too good to miss. In order to have critics and potential clients remember you, fashion houses come up with miracles of ingenuity and creative thinking. For instance, the show by Tatiana Parfionova turned into a fashionable literary performance: the models were striding the catwalk while reciting verses from Shakespeare’s “Twelfth Night.” The guests, mesmerized by the models’ acting abilities, appreciated the work of the designer: multilayer ensembles from the same fabric (skirts, trousers, aprons – often combined in a single piece), embroidery, complex collars, various jabots. In a bid for a cordial welcome, French fashion project I Love Fashion invited the notorious femme fatale Anna Chapman to take part in the show, while the models for Yegor Zaitsev (YeZ by Yegor Zaitsev) were accompanied by the designer’s favorite element – tentacles, a part of all of his collections, which this season have been transformed into scarves and bows. Dasha Gauser’s show focused on mysticism this year. “My heroine is the modern woman, at peace with herself and capable of mobilizing her inner force. But she is one of us, a Russian supergirl, and it is important for me that she be true and real – with no ‘S’ letter, no cape, no red nylon underpants up to her mid-chest,” said Gauser. The collection is designed for the Russian environment and uses traditional elements of Russian clothing (quilted jackets, thick-knit pieces, kerchiefs and shawls, soft pleats). Svetlana Tegin’s collection looked glamorous and dramatic, presented by models with impassive faces in semi-darkness and to the clacking of heels. Ascetic silhouettes, formal cut out garments, soft cashmeres and wools, silks and velvets, an unexpected glimpse of emerald amidst grey and black. Women’s beauty according to Tegin is fascinating and sometimes frightening. BEssARION, the show that closed Fashion Week, pleased the audience with its delightful combination of grey and lemon. The designer has discovered a method to give silk a knit feel with the help of original prints. BEssARION targets subtle poetic people, those who care for minimalist intellectual fashion. 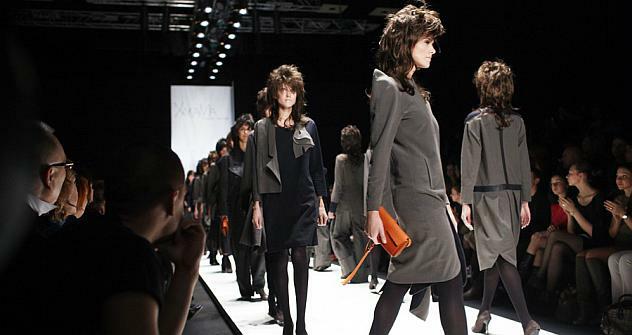 The next fashion week in Moscow will be held this autumn. The 25th anniversary season will showcase the designers’ spring-summer 2013 collections.